We are counted amongst one of the most well known manufacturers and suppliers of superior quality Duck Weave Fabric in the country. These find wide applications in making Bags and shoes. It has high strength, durability and can also be customized as per clients’ specifications. Its quality ranges from as high as 6Oz to 12Oz and can be availed at industry leading prices. Owing to our experience, we have been successful in catering to the requirements of our esteemed customers by delivering a superior range of Cotton Duck Fabrics. 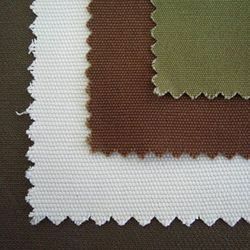 The offered range of cotton duck fabrics is available in a number of colors, sizes, patterns and other specifications in accordance with the emerging requirements of the valued clients. In addition to this, these products are highly appreciated in market for their resistance to tear and skin friendliness. Looking for Duck Weave Fabric ?